Micromarkets are a great addition to any company. They can complement a full-service corporate cafeteria or be a standalone food option to employees. Mini markets enable employees to have access to freshly prepared foods and meals, prepackaged snacks, frozen treats, and beverages at any time of day or night. When a corporate cafeteria is onsite, employees can trust that the fresh food offered in the mini markets is also prepared onsite. 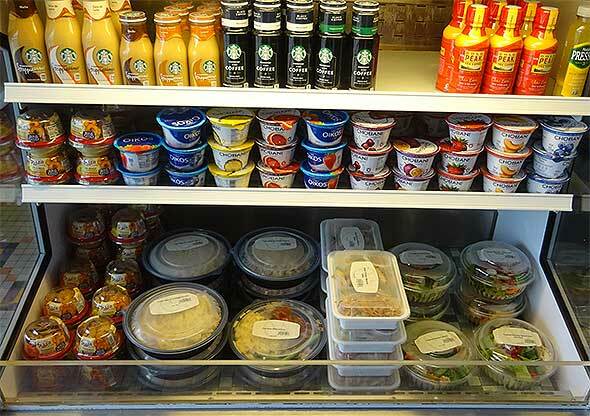 Café Services keeps micro markets stocked with a variety of breakfast and lunch foods, FitPicks choices, beverages, fresh-baked goods, and more, all based on individual location. There is flexibility in the food offerings. Employees can request that particular to-go meals, sandwiches, FitPicks, or salads be stocked more often or at particular times (to be available over the weekend, for instance). The available prepackaged snack options, such as chips, candy, and soft drinks, can be customized to employee favorites. Food in the micromarkets is turned over daily, so employees don’t need to wonder how old a sandwich or salad is when making a selection. Café Services staff keeps an eye on inventory throughout the day and becomes quickly aware of what sells well and what employees enjoy the most. Micro markets can be located anywhere in a company – proximity to the cafeteria varies – but fresh food options are guaranteed. With the 24×7 accessibility of a mini market, employees don’t have to keep track of when the cafeteria is open or closed, either. They can grab the food they want, when they want, and know it’s fresh. The mini markets are customizable to fit into any space. Commonly, they can be found next to the corporate dining room. 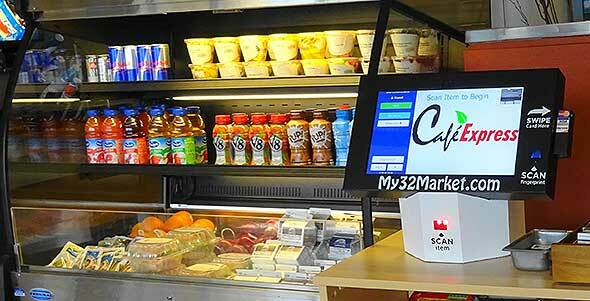 This enables employees to skip waiting in line, grab one item or many, and check themselves out. In a big facility, a micro market can be installed far from the cafeteria to enable everyone to have easy access to fresh food. In a small facility without a cafeteria, micro markets enable employees to have fresh food without needing to bring a meal or leave the building in search of food. Mini markets are standalone entities that don’t require staff. Similar to the now common self-checkout kiosks at big box stores and grocery stores, mini market checkouts enable an individual to purchase one or more items without assistance. Employees simply select an item, or items, scan the UPC code(s), and make payment. Payment options are cashless. The technology available enables payment via a credit card, a prepaid card, a microcard (small tags kept on keyrings), biometrics (a thumbprint), or a Smartphone (to scan and pay virtually). Personal accounts are managed online, so an individual can check their expenses, see their account balance, or even create their own budget limit if they need to keep spending limited, at any time. Online assistance is available 24×7 and contact details are noted at each kiosk. Corporations offering mini markets to their employees see an increase in cafeteria food sales, as the micro markets are an extension of the corporate cafeteria and are a tremendous amenity to 2nd and 3rd shift employees. Variety, local sourcing, custom menus, healthy options, creative chefs – that's corporate dining your way! Daily catering, special event catering, executive catering, any event, any size, we'll make you shine! We can manage every aspect of your event, small or large, onsite or off, you can count on Café Services. Our dietitians and chefs team up to provide an all-encompassing approach to health & wellness. A Variety of fresh food, snacks, and beverages made on-site available 24×7. We offer the freshest fruits and vegetables through partnerships with local farms. Our products are made from recycled, compostable and chlorine-free reusable materials. We offer the professional expertise and resources to support your project from design to implementation.